Snippets of several pieces from each CD can be listened to at the Shop page. "It used to be part of any good musician's trade to be able to compose on demand for a special occasion or a special person." 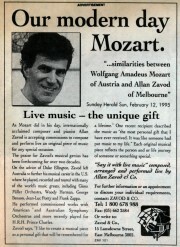 It is not stretching credibility too far to suggest some similarities between Wolfgang Amadeus Mozart of Austria and Allan Zavod of Melbourne. Both were piano prodigies born to violinist fathers. Both were ambitious men best recognized for their talents outside their homelands. And both had the grand view that music, the sublime force that governed their lives from birth, was a gift to be directly shared. 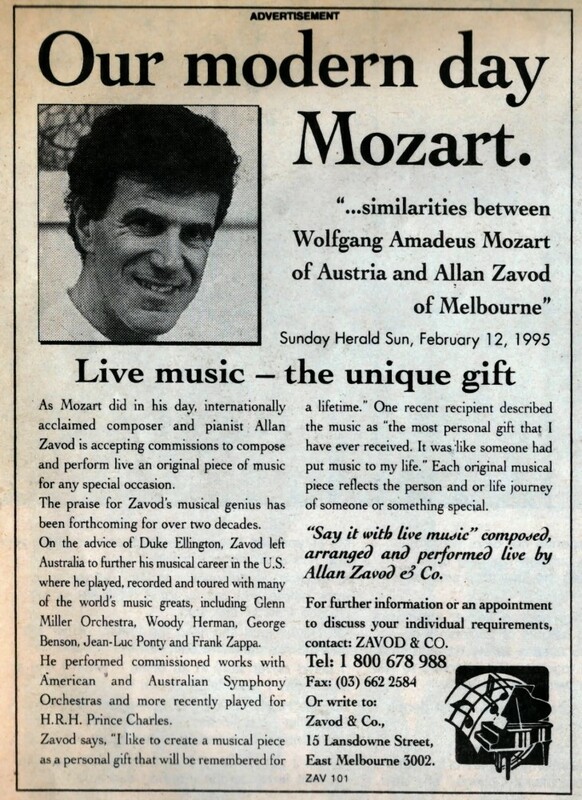 Melbourne-based Zavod, recognized long ago as a piano virtuoso by Duke Ellington, would have competed with the German genius as a composer for hire had he been working in Mozart's era. For a few francs, pfennigs or florins, he would have turned out a neat string quartet for your uncle's birthday, a couple of love songs for the wedding anniversary and maybe a cantata for grandma's 80th. 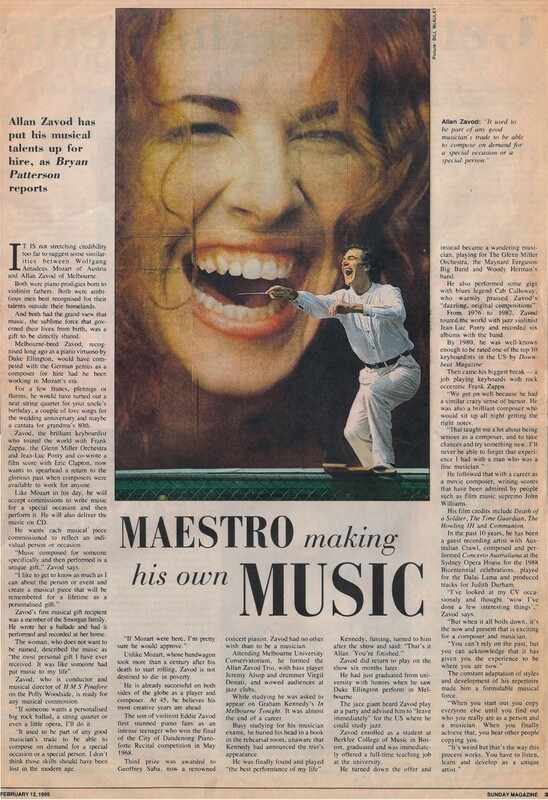 Zavod, the brilliant keyboardist who toured the world with Frank Zappa, the Glenn-Miller Orchestra and Jean-Luc Ponty and co=wrote a film score with Eric Clapton, now wants to spearhead a return to the glorious past when composers were available to work for anyone. Like Mozart in his day, he will accept commissions to write music for a special occasion and then perform it. He will also deliver the music on CD. He wants each musical piece commissioned to reflect an individual person or occasion. "Music composed for someone specifically and then performed is a unique gift." Zavod says. "I like to get to know as much as I can about the person or event and create a musical piece that will be remembered for a lifetime as a personalized gift." Zavod's first musical gift recipient was a member of the Smorgan Family. He wrote her a ballade and had it performed and recorded at her home. 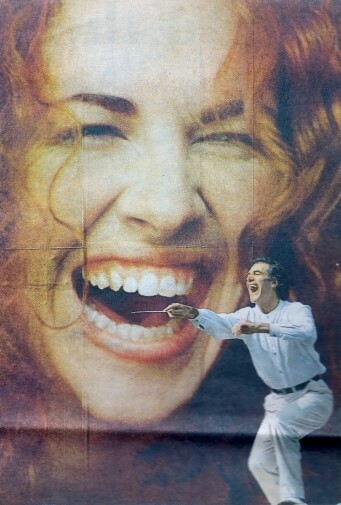 The woman, who does not want to be named, described the music as "the most personal gift I have ever received. It was like someone had put music to my life." Zavod, who is conductor and musical director of "H.M.S Pinafore" on the Polly Woodside, is ready for any musical commission. "If someone wants a personalized big rock ballad, a string quartet or even a little opera, I'll do it. It used to be part of any good musician's trade to be able to compose on demand for a special occasion or a special person. I don't think those skills should have been lost in the modern age. If Mozart were here, I'm pretty sure he would approve." Unlike Mozart, whose bandwagon took more than a century after his death to start rolling, Zavod is not destined to die in poverty. He is already successful on both sides of the globe as a player and composer. At 45, he believes his most creative years are ahead. The son of violinist Eddie Zavod first stunned piano fans as an intense teenager who won the final of the City of Dandenong Piano forte Recital competition in May 1968. Third prize was awarded to Geoffrey Saba, now a renowned concert pianist. Zavod had no other with than to be a musician. Attending Melbourne University Conservatorium, he formed the Allan Zavod Trio, with bass player Jeremy Alsop and drummer Virgil Donati, and wowed audiences at jazz clubs. While studying he was asked to appear on Graham Kennedy's "In Melbourne Tonight." It was almost the end of a career. Busy studying for his musician exams, he buried his head in a book in the rehearsal room, unaware that Kennedy had announced the Trio's appearance. He was finally found and played "the best performance of my life." Kennedy, fuming, turned to him after the show and said: "That's it Allan, You're finished." Zavod did return to play on the show six months later. He had just graduated from university with honors when he saw Duke Ellington perform in Melbourne. The jazz giant heard Zavod play at a party and advised him to "leave immediately" for the US where he could study jazz. Zavod enrolled as a student at Berklee College of Music in Boston, graduated and was immediately offered a full-time teaching job at the university. He turned down the offer and instead became a wandering musician, playing for The Glenn Miller Orchestra, the Maynard Ferguson Big Band and Woody Herman's Band. He also performed some gigs with blues legend Cab Calloway, who warmly praised Zavod's "dazzling, original compositions." From 1976 to 1982, Zavod toured the world with jazz violinist Jean-Luc Ponty and recorded six albums with the band. By 1980, he was well-known enough to be rated one of the top 10 keyboardists in the US by "Downbeat Magazine." Then came his biggest break - a job playing keyboards with rock eccentric Frank Zappa. "We got on well because he had a similar crazy sense of humor. He was also a brilliant composer who would sit up all night getting the right notes. 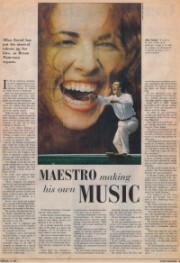 That taught me a lot about being serious as a composer, and to take chances and try something new. I'll never be able to forget that experience I had with a man who was a fine musician." He followed that with a career as a movie composer, writing scores that have been admired by people such as film music supremo John Williams. His film credits include: "Death of a Soldier", "The Time Guardian", "The Howling III" and "Communion." In the past 10 years, he has been a guest recording artist with Australian Crawl, composed and performed "Concerto Australiana" at the Sydney Opera House for the 1988 Bicentennial Celebrations, played for the Dalai Lama and produced tracks for Judith Durham. "I've looked at my CV occasionally and thought, wow I've done a few interesting things" Zavod says. "But when it all boils down, it's the now and present that is exciting for a composer and musician. You can't rely on the past, but you can acknowledge that it ahs given you the experience to be where you are now." The constant adaptation of styles and development of his repertoire made him a formidable musical force. "When you start out you copy everyone else until you find out who you really are as a person and a musician. When you finally achieve that, you hear other people copying you. It's weird but that's the way this process works. You have to listen, learn and develop as a unique artist."